With local strawberry patches almost in full production, Limehouse Produce is excited to kick-off their annual Berry Creative Campaign. 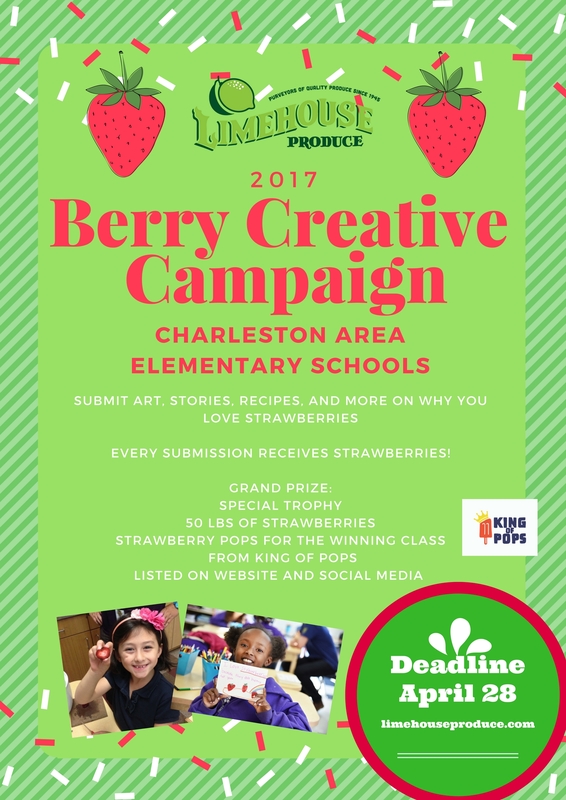 For the campaign, Charleston area elementary schools submit their best artwork and creative projects promoting strawberries. School classes can submit recipes, drawings, artwork, or stories all showcasing more about the popular fruit. The Overall Winner receives a Grand Prize of 50 pounds of local strawberries, strawberry pops from King of Pops for a celebratory party, a special trophy to display at school, and an announcement on Limehouse Produce’s website. Every school that submits entries receive 10 lbs. of strawberries. The Charleston County Library Main Branch will have a special display showcasing some of the items in May. To learn more about the “Berry Creative” Strawberry Campaign, visit www.limehouseproduce.com. The holidays are in high gear, and before you know it, it will be the beginning of the year. January is prime time to showcase delicious citrus in exciting and delicious ways and is also the time for Limehouse Produce’s annual Citrus Celebration. This year, we are asking chefs and mixologists to focus on one very special variety of fruit: the Page Mandarin. The Page is a cross between a Minneola Tangelo and a Clementine Mandarin, making it essentially ¾ mandarin and ¼ grapefruit by ancestry. The grapefruit gene gives this sweet and easy-to-peel fruit a more complex flavor that the super sweet clementine, lending itself to tart cocktails, winter salads and palate cleansing pastries. Competitors can submit savory, sweet, or drinks utilizing the Page Mandarin and any additional citrus fruits they wish. All submissions will be posted on the Limehouse Produce website starting January 9. The public can vote on their favorites as well as go and visit the locations to order the items. They can then post photos for a chance to win a gift certificate at a winning location. If interested in being a part of the 2017 Citrus Celebration, email angel@hometeampr.com. We will then deliver a sample of Page Mandarins to try out on week of December 19. Dish and drink details, recipes and photos are due no later than Friday, January 6 in order to have part of the website on the official kick-off on Monday, January 9. For the Celebration, there will be a panel of judges that visit the top 5 drinks and dishes (as selected by the judges) to taste the items the week of February 20. The judges will select one winner for Best Drink and Best Dish. Each winner will be promoted on the website, social media outlets, and to the media. 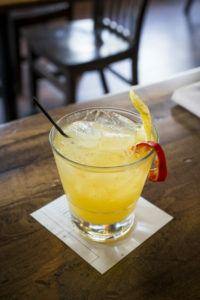 The restaurant with the winning dish will be featured on the back page of Charleston City’s Paper’s DIRT and the winning drink will be featured in a ½ page ad in The Local Palate. *Note: ads will be designed by Limehouse in cooperation with winning restaurants. Interested restaurants can submit their photos and caption details to angel@hometeampr.com. We hope to have you a part and look forward to hearing from you soon! Limehouse Produce is excited to announce the winner of this year’s 2016 Fall Cornucopia Cook-Off that took place November 11 at the Culinary Institute of Charleston. 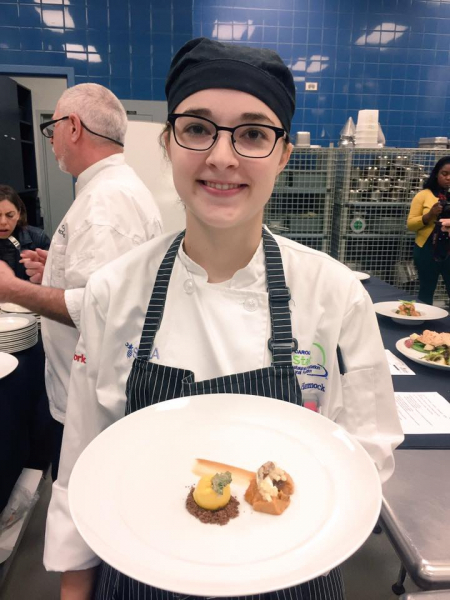 Michelle Hammock of West Ashley High School won with her “Autumn Harvest” dish which was a series of small desserts featuring candied kale, mini pumpkin pie, candied pecans with spiced apples, topped with kabocha squash ice cream, caramel sauce, and whipped cream. This was Michelle second year competing in the cook-off. Now in its second year, the competition invites local high school culinary programs to have their students submit recipes featuring fall produce. The finalists from the schools come and cook their dish in front of an esteem panel of judges. This year, five students from Wando High School and West Ashley High School’s culinary programs participated. Judges included Executive Chef Michelle Weaver from Charleston Grill, Post & Courier food reporter and restaurant critic Hanna Raskin, Jamie Vaughn from Limehouse Produce, and Marion Sullivan from the Culinary Institute of Charleston. The winner received $125 courtesy of Feed the Need, a behind-the-scenes tour with Chef Weaver including dinner at Charleston Grill, and will be featured in a Local Palate magazine ad. To learn more about the Fall Cornucopia Cook-Off, visit www.limehouseproduce.com. To download the recipe, click here michelle-hammock-recipe. 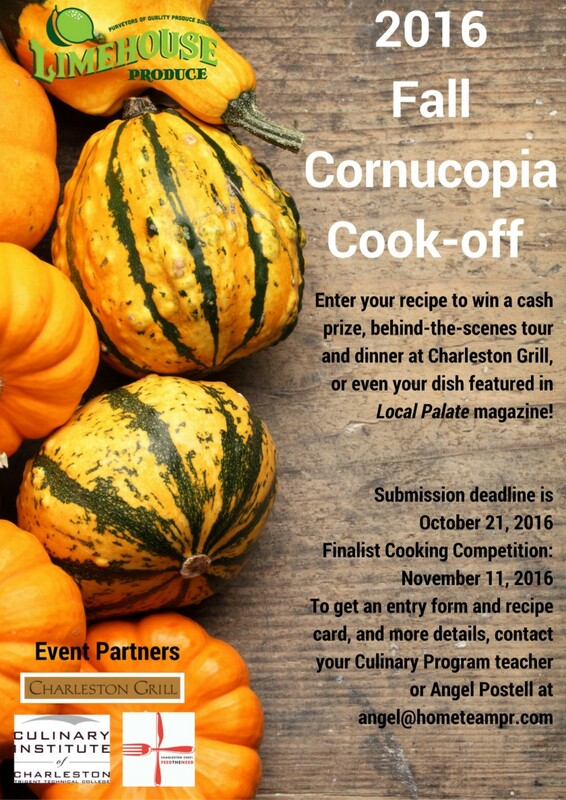 Limehouse Produce announces details of their 2016 Fall Cornucopia Cook-Off that will take place November 11 at the Culinary Institute of Charleston. Now in its second year, the competition invites local high school culinary students to submit recipes featuring fall produce. Each student’s culinary program director selects one recipe from their school to participate. The three most compelling entries will be selected to compete in a live cook-off. Finalists will cook their dish in front of a panel of esteemed judges including Executive Chef Michelle Weaver from Charleston Grill, Post & Courier food reporter and restaurant critic Hanna Raskin, a representative from Limehouse Produce and from the Culinary Institute of Charleston. The winner receives $125 courtesy of Feed the Need, a behind-the-scenes tour with Chef Weaver including dinner at Charleston Grill, and is featured in a Local Palate magazine ad. All finalists win cash and prizes. Ethan Tordoff from Fort Dorchester High School was the winner of the 2015 competition. To learn more about the Fall Cornucopia Cook-Off, visit www.limehouseproduce.com. For an application and recipe form, email angel@hometeampr.com. It’s almost the time of year for menus to feature a sea of red, juicy local heirloom tomatoes!! 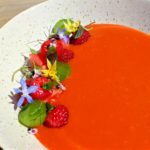 Locals and visitors alike always love going out and enjoying the creative dishes and drinks featuring the local delicacies and Limehouse Produce is excited to once again promote it all with their annual Heirloom Tomato Trek. The Heirloom Tomato Trek will run from June 20 to July 22 with a goal of promoting more to the public about the varietals, the local farmers, the supporting chefs, and more. As part of the campaign, we are asking our restaurants, chefs and bartenders to consider getting behind the effort. We are asking you to submit photos and details on your dishes or drinks featuring local/heirloom tomatoes so we can promote on a special online website to the public. Patrons can then vote on their favorite posted items. A panel of judges will then go and select the best dish or drink as the winner who will receive a truck wrapped with an dish image for a period of time promoting the restaurant, and a special tomato trophy to display proudly. If a restaurant/chef participates in this campaign, they will be promoted as part of the Trek via various outlets including a map listing all the participants. Limehouse Produce will be encouraging patrons to go to the participating places and order the featured dish or drink. Once they order, they are asked to take a photo and submit online and one lucky patron will a $100 gift card to the winning restaurant. If you want to be involved in a different way, and have recipes you want to submit, we promote those as well. You can host a special event during the timeframe and we will help promote it. We also encourage any onsite promotions at your establishments/through your outlets. We can provide more on the varietals, photos and more details if needed. Thank you in advance for your consideration and we hope to hear from you soon. Time is short as the promotion will kick off June 20 so please submit your details as quickly as you can.